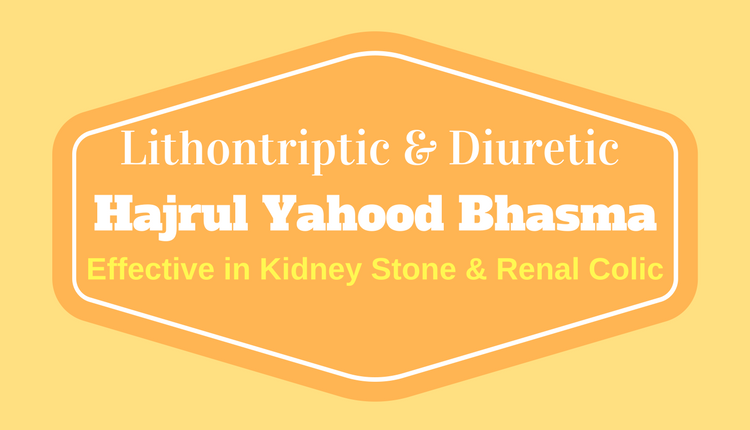 Hajrul Yahood Bhasma (also known as Sange Yahood Bhasma, Ber Patthar Bhasma, Badarashma Bhasma, Hazrul Yahud Bhasma or Calcined Lime Silicate) is an ayurvedic-calcined medicine used for kidney stones, Dysuria, and renal colic. Hajrul Yahood (Hazrul Yahud) is a type of stone, also called as Ber Patthar. These stones are fossilized stones. The main composition of these stones is Lime Silicates. Hajrul Yahood Bhasma has following main health and therapeutic properties. Therapeutically, Hajrul Yahood Bhasma is used in following health conditions. Dusting powder prepared from Hajrul Yahood Bhasma is applied on the skin for following skin diseases. Crystalluria is a condition in which crystals are found in the urine. It occurs due to either urinary calculi or side effects of certain medicines. The medicines causing Crystalluria are penicillin and sulfonamides. Hajrul Yahood Bhasma along with Chandraprabha Vati helps in such condition. A month course with these remedies eliminates the Crystalluria. In case, Crystalluria recurs repeatedly, then the course with these remedies should be taken for at least three months. In addition to this, adding Chandanasava in the treatment helps as adjuvant. The dosage of Hajrul Yahood Bhasma varies according to the health condition and age of the patient. The general dosage varies from 250 mg to 500 mg twice a day. The maximum dosage of Hajrul Yahood Bhasma should not exceed from 2 grams per day. There is no authentic information available for the side effects of Hajrul Yahood Bhasma (Hazrul Yahud Bhasma) and its use in pregnancy and breastfeeding. Stay safe and avoid using Hajrul Yahood Bhasma in during pregnancy.